Would you like to rent a Segway for a day? That’s possible! You can rent a Segway i2 for a specific period of time. Before you get started you will first be instructed (30 minutes). Safety comes first. For this reason you can only rent a Segway (unaccompanied) after having followed our training. This once-only training will take approx. 30 minutes. Once you have successfully participated you won’t have to follow a training again next time. Are you interested in teaching other people how to drive a Segway? Yes? We offer a more extensive training! Besides theory and driving a Segway, you will learn how to instruct other persons. This training will take approx. 2 hours and is suitable for max. 2 persons per training. The trainings are held at our location in Rotterdam. At an extra price it is possible to organize the training elsewhere. 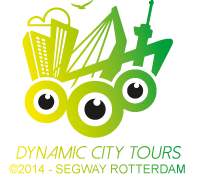 The deposit is €500,- per Segway and only applies to people who set off on their own (unaccompanied). The deposit is not applicable to our tours. The own risk in case of theft or loss of the Segway is higher than the deposit. The deposit can only be paid in cash or by means of a bank transfer. Above mentioned prices are inclusive of 21% VAT. If you rent a Segway with us for the very first time, you should take the training costs into account. Half a day means 4 hours, the entire day means 8 hours. Compact, comfortable and user-friendly: Features of the Segway Personal Transporter Type i2; the most all-round Segway model, focused on efficient transport on paved roads. A perfect means of transport for the city centre or other crowded places, thanks to its superb manoeuvrability. This intelligent means of transport meets all your transportation needs in a pleasant, but above all versatile way; both indoor and outdoor, smooth or steep surfaces. Always noiseless and emission-free.